Ingredients:Herring (source of glucosamine & chondroitin sulfate), dehydrated herring (source of glucosamine & chondroitin sulfate), potato, herring & salmon oil blend (preserved with mixed tocopherols), dehydrated egg product, chicken protein concentrate, dried carrots, sun-cured alfalfa meal, chicory root extract, fructooligosaccharide, yeast extract (source of mannan-oligosaccharides), dehydrated sweet orange, dehydrated pomegranate, dehydrated apple, dehydrated spinach, psyllium seed husk, dehydrated blackcurrant berry, dehydrated blueberry, salt, brewers dried yeast, turmeric, vitamin A supplement, vitamin D3 supplement, vitamin E supplement, ascorbic acid, niacin, calcium pantothenate, riboflavin, pyridoxine hydrochloride, thiamine mononitrate, biotin, folic acid, vitamin B12 supplement, choline chloride, beta-carotene, zinc proteinate, manganese proteinate, iron proteinate, copper proteinate, selenium yeast, DL-methionine, taurine, L-carnitine, aloe vera gel concentrate, green tea extract, rosemary extract. Guaranteed Analysis:Crude Protein (min): 44.00%; Crude Fat (min): 20.00%; Crude Fiber (max): 1.80%; Moisture (max): 10.00%; Ash (max): 8.50%; Calcium (min): 1.50%; Phosphorus (min): 1.30%; Magnesium (max): 0.09%; Taurine (min): 0.40%; Omega-6 Fatty Acids* (min): 3.10%; Omega-3 Fatty Acids* (min): 1.40%; Docosahexaenoic Acid (DHA*) (min): 0.80%; Eicosapentaenoic Acid (EPA*) (min): 0.50%; Glucosamine* (min): 900mg/kg; Chondroitin Sulfate* (min): 600mg/kg. 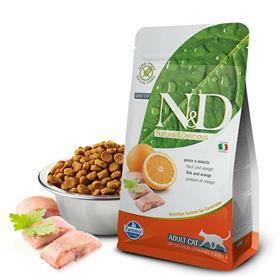 *Not recognized as an essential nutrient by the AAFCO Cat Food Nutrient Profiles.